Crafting sometimes requires innovation, and occasionally I need a tool I don't have available. A Scrap Wrapper is a plastic gadget like a ruler with a slit in the center that has room for your sewing machine presser foot. It makes a large fringe for cotton rugs, but I want to make tiny flowers that look like carnations for ribbon crafts, or smaller fringe. You can use a seam gauge for a ribbon wrapper. Slide the stop to one end and start wrapping the ribbon from one end to the other. Don't overlap and don't wrap tightly. Cut the end of the ribbon. Go to the sewing machine and stitch in the center opening of the seam gauge to the end. Pivot the gauge and stitch back to the starting point. Leave some thread to pull for gathers when you're done. Cut each side of the ribbon with scissors by sliding the sharp point under the ribbon even with the wrapped edge. Cut the ribbon on both sides and pull it through the seam gauge from the center. 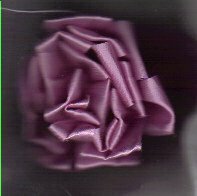 Now you have a ribbon that can be gathered into a carnation for ribbon embroidery. Pull the thread to make the gathers and roll the ribbon into a round. 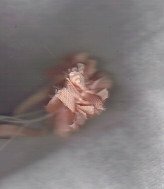 Use the excess thread to wrap the back tight to keep the flower shape. You can also make your own scrap wrapper with cardboard. Here's the easy way: Cut two strips of cardboard about half an inch wide and 20 inches long. Cut two squares of cardboard about 2 inches square. Line the strips parallel to each other and place a square on each end. Staple the squares in place. Wrap ribbon (I used 3/4 inch ribbon) on the two strips. Don't wrap it tight or you won't be able to sew between the strips. Sew between the strips from one end to the other, pivot and return slightly to the side of the first row of stitching. (This makes it easier to gather.) Leave enough thread to pull for gathers. Cut the ribbon on each side of the strips and pull it out through the middle opening. 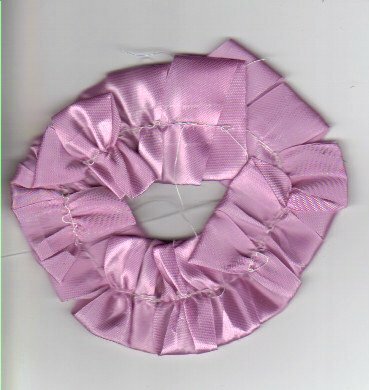 Alternatively, if you would like to have puffy ruffles that aren't cut, remove one square you stapled on the end of the cardboard wrapper and slide the stitched ribbon off the strips. 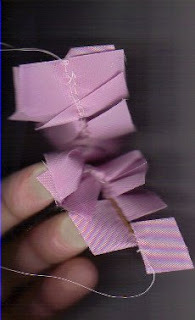 Pull the thread to gather the ruffle and use it for your crafts projects. This could make a garter for a wedding or an adornment for just about any fabric crafts project. You can also make flowers by cutting a fabric circle for backing. Starting in the center, stitch the ribbon in a continuous circle from small to larger.